A line of products for the permanent reconstruction of hair damaged by atmospheric agents, substances such as chlorine and overly aggressive chemical treatments, super-lightening coloring products or bleaching products. 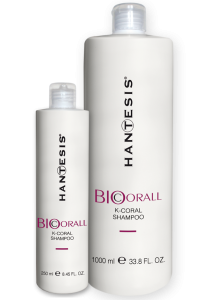 BIO-CORALL contains Coral Algae, Keratin Amino Acids, Provitamin B, and Vitamins A and E. It works directly on the inside of the hair shaft, where it can be irreparably damaged, in the cortex. A shampoo containing Coral Algae for the total reconstruction of hair damaged by overly aggressive chemical treatments. Rich in amino acids from keratin, pro vitamin B, vitamins A and E, it has a permanent reconstructive and anti-oxidant effect to prevent ageing of skin and the hair shaft. HOW TO USE: apply the required amount of product on wet hair and shampoo, gently. Rinse and repeat if necessary. Proceed to apply Re-Constructive Oil or Coral Algae Mask. 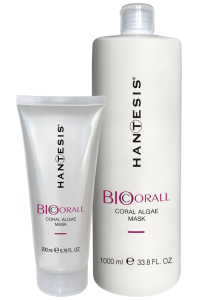 A nourishing mask containing Coral Algae for total reconstruction of hair damaged by overly aggressive chemical treatments. Rich in substances similar to natural keratin, B, A and E group vitamins for hair’s internal structure. Reconstruction with an anti-oxidant effect for preventing skin and hair ageing. HOW TO USE: shampoo with K-Coral Shampoo. Towel dry to remove excess of water. Apply the required quantity of Coral Algae Mask and cover with a plastic shower cap and then a towel. Leave product in place for 5/10 minutes. Rinse with plenty warm water. Re-Constructive Oil is rich in vitamins, Coralline Algae and anti-oxidants to fight free radicals and ageing of the hair shaft. It also strengthens the hair’s keratin structure adding strength, body and vitality. HOW TO USE: shampoo the hair with K-Coral Shampoo and towel dry, apply the product to middle length and ends, lightly massage, and leave it to process for 5/10 minutes. Rinse well with lukewarm water. Shining Mist, a NO-GAS spray containing active ingredients which add softness and special shine to the hair while eliminating static electricity. HOW TO USE: use Shining Mist when hairstyling is completed, holding the applicator bottle at a distance of about 25/30 cm, spray sparingly to whole hair.